Oregon is a beautiful state in the Pacific Northwest of the United States. On the west side of the forest covered Cascade Mountains stretch along the coast while the eastern side of the state is a dry and beautiful desert. Because of the variety of geography, varied ecological attributes and a relatively low cost of living, Oregon has become a popular relocation state for many Americans looking for all the things Oregon has to offer. As more people are moving to Oregon and settling into living situations, Wilding Wallbeds is thrilled to now offer shipping services to the state of Oregon. Our superb and handsome wall beds make a stunning and very functional part of your surroundings. And for any Oregonians updating their homes or replacing beds, don’t do a thing until you have browsed our website and talked to our specialists about the many ways Wilding Wallbeds can make a difference in your life. The Remington Murphy Bed is by far one of our most popular designs in our Studio Series Collection. It is a beautiful piece of fine crafted alder wood furniture featuring traditional, shaker-style hardwood trim. The cabinet and matching shelves on each side will look spectacular in a bedroom, dining or living room (for guests or studio apartment living quarters). 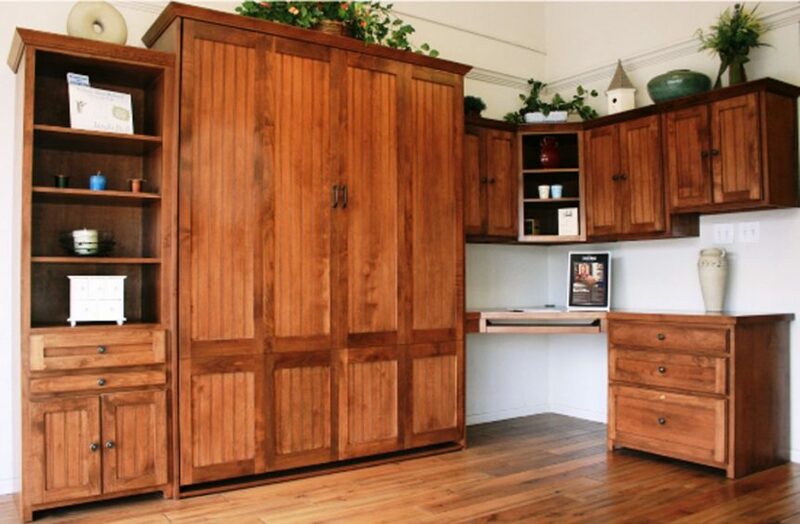 The Park City Murphy Bed is a queen bed made of sawn oak and built in mission style. It has matching side cabinets in the same style and gives a room a hearty, rustic and bold look. The Brittany Wall Bed is a traditionally styled piece made of mahogany. It is a perfect bed to make your office serve two purposes, an office by day and guest room by night. It even features a built in, fold down table, perfect for desk use. The American Craftsman Wall Bed is a fantastic piece of furniture make of oak and crafted in the mission style that was so popular in early America over 200 years ago. This style has retained its original charm and has become a standard of American furniture style. The Tuscany Wall Bed is named for the region in Italy famous for the style that is used in this piece of furniture. It is made of cherry wood and is the crown jewel of our top-of-the-line Gallery Series. The worked French curves, the fluted columns, and the charming rosettes set it apart from anything ordinary. The Studio Desk is a modern, very European styled wall bed. The bed, along with the matching side shelves and cabinets will literally make your office a guest room instantly with no effort as nothing has to be moved, not even the items on the top of the built-in desk. The design and mechanics of this bed allow the desktop (which is the width of the bed) to remain completely parallel to the floor while opening the bed, and the desk contents remain completely hidden under the bed while it is in use. It is awesome. The Murphy Bunk Beds are available in our Homefront and our Galley Series. Have you ever wanted more room for your children to play? With our bunk beds, you do not need a separate toy room as your child’s bedroom immediately becomes a toy room when the beds are out of the way. The Wilding Power Wall Bed is a masterpiece of fine crafting and technology. This beautiful entertainment center along with its matching side shelves and cabinets, contains a bed that actually folds itself out of the lower cabinet of the unit with just a push of a button. It automatically folds itself back into the cabinet the next morning. It comes in a variety of hardwoods and styles, so you will be sure to find the perfect one for your home. The Do-It-Yourself Murphy Bed Kit is just what the name implies. This kit is made with your choice of our finest hardwoods and our lifting mechanism hardware. An experienced do-it-yourselfer will be able to follow our easy instructions to craft an originally designed bed that has his or her style with quality bed components that work. If you live in Oregon or are relocating to this lovely state, please contact Wilding Wallbeds for the highest quality Murphy beds in the business. We help make your home shine! We use only hardwoods (particle board is never used in our products) and we stand behind every piece of furniture we offer to you.